TerrorDome Haunted Scream Park returns this October to terrify the Hudson Valley. TerrorDome offers three exciting haunted attractions; The Barn of Terror, Zombie Tag and Backwoods. the gates to TerrorDome swing open every Friday, Saturday, and Sunday night through the month of October. The Barn of Terror is a turn of the century two story real life haunted barn. As you enter this old wooden barn you will immediately feel a chill from the spirits of past lives trapped inside of this building. What apparition will you encounter? Chances are it won’t be friendly. 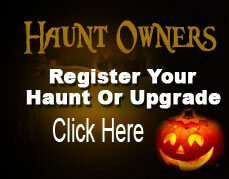 Hide in the haunted house while being stalked by zombies! You and your friends will enter the haunt, each wearing a TerrorDome Zombie Tag badge. The badge blinks green for healthy, yellow for infected, red for zombie. Your goal is to avoid coming in contact with any zombies which are hiding and ready to scare. If you become infected, you have to find a health station to quickly heal or YOU will turn into a zombie and infect your friends. You have 5 minutes to survive in this haunted house! As you walk blindly into the woods on a cold, crisp autumn night with only the glow of the moonlight remember there will be danger lurking in the shadows. A wild animal – perhaps a bear or a madman will wait until you’re deep enough where nobody will hear your screams. TerrorDome Haunted Scream Park is located in New York’s Hudson Valley at 84 Lakeside Rd in the Town of Newburgh (84 Lakeside Rd., Newburgh, NY 12550). We are conveniently located just off of I-84 / I-87 and only 90 minutes from New York City as well as Albany, NY.